One of the parental tasks that is never fun is taking kids in for vaccinations. I never know what to expect when I go in. Isabelle (21 months old) has been the easiest kid lately, and has barely even blinked when getting shots or even blood draws. Clara (3.5 years old) on the other hand… yikes. Is anything with three year olds easy?! I don’t think so. Anyways, last week Tim and Clara walked into the pharmacy to get her shot and the pharmacist recommended that Clara get the shot first, so that she wouldn’t see Tim get his. Tim responded that they had already discussed the shot, and that Clara knew she’d be getting one and what it was, and she had requested Tim go first so she could see it. The pharmacist rolled her eyes and gave Tim his shot. Then when it was Clara’s turn, the pharmacist suggested distracting her and having her look away, etc. Tim responded that Clara wanted to watch (I don’t know why, I don’t like watching!) and already knew she was getting a shot, so there was no need to distract her. I guess the pharmacist was getting pretty annoyed with Tim because she didn’t want to deal with a hysterical toddler. BUT, here’s the thing, Clara watched the pharmacist disinfect her arm, watched her prep the shot, watched the shot go in, and was completely fine. No tears, no screaming, nothing. She then got a ‘bravery sticker’ and a lollipop, of course. The pharmacist commented to Tim that she had never seen a kid Clara’s age react so well to a shot. To which I thought, that’s probably because you try to get them to look away and then jab them in the arm with a needle! I wouldn’t react well to that either! I’m pretty sure if someone came out of nowhere and stabbed me with a needle my first instinct would be to hit them! Now, I’m not saying this will work for every child, and it might not even work for Clara again, but I am a huge proponent of treating children respectfully, and part of that includes not tricking them. In my mind, not telling Clara that she’s going to get a shot or trying to distract her so she doesn’t notice what is happening is just not respectful behavior. I would rather deal with a crying toddler because of an ‘owwie’ than a crying toddler because they feel like I lied to them. Let them know what to expect in a laid-back manner. Answer their questions as honestly as you can. We play a lot of ‘doctor’ at our house with this kit that Clara received for Christmas. The more we normalize doctor’s visits, the easier it has gotten for us! Also, we try to tell Clara in detail what to expect from vaccinations or any sort of procedure. We act out the whole thing several times, we tell bedtime stories about Daniel Tiger (her fav!) getting a shot and being brave, etc. We basically bring it up as specifically as possible, as often as possible, the day before the big event. Our pediatrician gives stickers and small toys to children after visits, so I always call these ‘bravery treats’ and tell Clara how brave she is after the experience. Even if she cries (which she usually does!) I tell her that even brave girls cry when they get hurt and that she’s doing awesome. She generally recovers in less than a minute, especially if she gets a bandaid with characters on it! Gosh the girl loves her bandaids. + Bring it up at the last minute. If I know we’re going for shots on a Wednesday, I won’t bring it up with Clara until that morning, or really until we need to get ready to walk out the door. If I brought it up on Monday, I think she’d be worried about it for the next two days. I know some kids need a lot of mental time to prepare for things, but in our experience, Clara doesn’t need much time to think about the actual event, although we might start playing doctor and telling stories about doctor visits a few days ahead of time to start making it become a positive thought. I am very aware that all toddlers are different and that what works for one toddler may not work for another! At 21 months old, Isabelle does great with being distracted at the doctor’s office and getting a shot when she isn’t looking. I still tell her what’s going on, but she is much more interested in playing with a new toy than in anything I have to say. I don’t intentionally distract her, but I let her do what she wants to do. At Clara’s age, though, I think it’s important to treat her respectfully so that she doesn’t think I’m trying to trick her. I might feel differently about this whole thing if she was a kid who kicked and screamed her way into the doctor’s office, but thankfully she loves going (even if she knows there’s a shot involved!) so we don’t have to fight that battle. Also, when taking both kids in for shots, it’s hard to know which order to do things in. When we did blood draws for the girls, Isabelle went first and didn’t flinch, whereas Clara freaked out. I’m sure if Isabelle had cried that would have made things worse for Clara, so I’d probably say in the future I’d do older kid first, then younger kid (since Isabelle doesn’t seem to be concerned at Clara’s crying). Unfortunately I never know who’s going to be calmer on any given day, but I’d recommend the calmer kid going first and hopefully setting a good example! 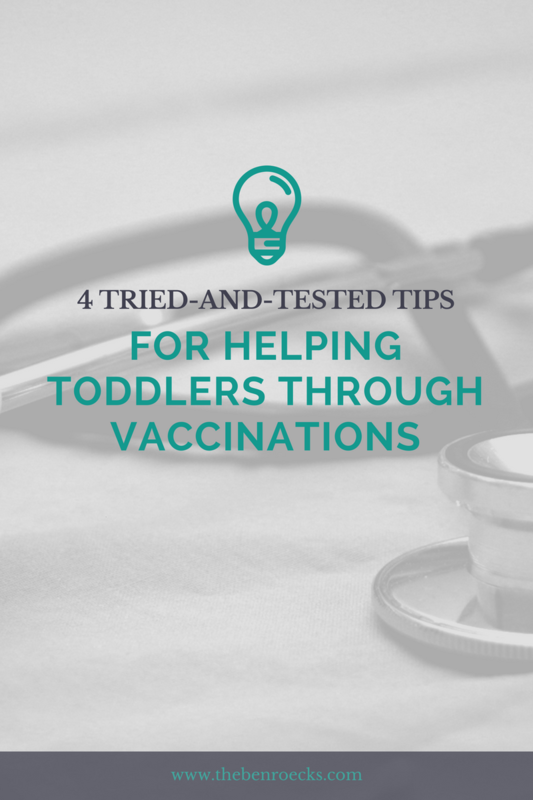 Do you have any tips/tricks for dealing with kids & vaccinations?! This entry was posted in motherhood and tagged motherhood, toddlers. Bookmark the permalink. These are all super helpful!!! Thank you!!! My mom always offers to come with me when they both get them 😉 I’m a wuss and don’t dare do it on my own hahaha. It’s been fairly ok so far. But I’m definitely keeping these in mind for Bensen’s shots coming up at his three year appointment. Hahahaha poor Azalea! that’s like Isabelle and Clara. Normally Isabelle is completely unfazed while Clara is a mess! We’re working on it, though! Man, Clara’s braver than I am when it comes to shots! Haha. I can’t even see the syringe without getting lightheaded, never mind watching someone actually administer the shot. But I do remember when I was younger, especially when I got my shots before kindergarten, how badly I wanted to be brave and not cry (and I didn’t! Until later that night when I got home, which my parents attributed to post-vaccination irritability.) Clearly the bravery angle stands the test of time! Hahaha she’s braver than I am, too. I NEVER look! I’m right there with you on being open and honest about shots. Caleb has had to have a lot of blood draws recently and he’s such a champ about them – I think a lot of it has to do with us being open and honest! Awww bummer about the blood draws but awesome he handles it so well! We have to go all the way to the children’s hospital for blood draws because our ped doesn’t do them – it’s such a hassle! You guys handled that like pros! It probably also really helped Clara to see Daddy get his shot and not cry or panic. I love how you guys handled this! Great job!